Top Reasons To Visit Gippsland's Gentle Dentists! We’re a family business! When we attach our family name as part of our practice, it’s our way of pledging we will always provide the highest quality dentistry possible. We’re locals! We live in Traralgon and will always support our neighbouring small businesses and the Gippsland community. The same dentist! We aren’t going anywhere, not skipping town, not moving overseas, not moving to Melbourne… The same friendly gentle dentist you had before will be on-hand to look after you. Not just one time – every time! 2 for the price of 1! Have one implant, get the second one placed free. Dental implants are the best way to chew, speak and smile! No referral necessary and no need to travel to Melbourne for first class treatment! We’re affordable! We’re always looking to lower our fees yet still maintaining excellence in oral health care. That’s why we’re preferred health insurance providers, and have pay plans available. We guarantee our work! If any filling falls out for whatever reason within 12 months, or if a crown / bridge / implant fails within 5 years, we’ll fix it for free. Our orthodontic treatment includes cleans and whitening at no cost! Because healthy teeth equal a better smile. We’re at the cutting edge of technology! Our instrument cleaning centre is at the forefront of modern technology, and we only use proven white filling materials. Leave your worries behind! For some, visiting the dentist can create anxiety. Our amenities, happy gas, and smiling faces can help alleviate anyone’s worries. Our long history! 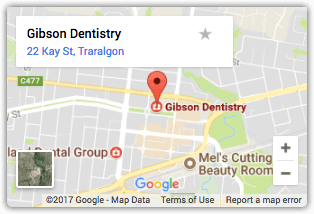 This practice has been serving Traralgon for over 40 years, with Dr Graham Berrett relocating the practice to 22 Kay St in the 1970s.